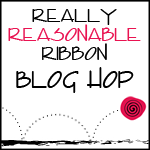 Hi everyone and welcome to the February Really Reasonable Ribbon Blog Hop. If you arrived here from Judy’s Blog, then you are on the right track. If you just happened along, be sure to hop back to the Really Reasonable Ribbon’s Ramblings Blog and start from the beginning so you don’t miss a thing. This month we are showcasing the RRR February Ribbon Club Assortment that is a fun mix of greens! Can you see all the ribbon club ribbons on my card?? Yup, the background is made up a portion of all the ribbons in the assortment with the exception of the white seam binding. I’m a quilter (among other things) and I wanted to replicate a bargello quilt pattern. I’m very pleased with how it came out. I made the large bargello ‘fabric’ piece below from a portion of each of the ribbons in this month’s assortment and then I ‘fussy cut’ the background square out so it would look the way I wanted it to for the background of the card above. There was still plenty left after the first card, so I can use the rest on other projects. I made this second card with some of the leftover ribbon background I made. We’ll be giving away a February Ribbon Club Assortment on the RRR Blog to one lucky random winner, so be sure to leave a comment on each blog along your way and then head back to the RRRR Blog to answer our ‘Question of the Month’ for a chance to win. Your next stop is Heidi’s fabulous blog. As a thank you for visiting my new blog, I will be giving away a ribbon club assortment and the card below to a random commenter on this blog. I’d love to have you become a follower too, but that is not required. The winner will be announced here on Friday, 2/17. If you’re interested in a tutorial on how to make a fun ribbon bargello background like the one I made, let me know. It’s easier that you’d think. If there is any interest, I’ll show you how to do it on my next post on the RRR Blog. Love your cards, and would love to learn how to do your ribbon. Thank you for sharing and the chance to win. Both of these are gorgeous, What an amazing card with all those ribbons. OMGosh! That is phenomenal!!! I was stunned with how amazing it looks! I am SO trying this! Brillant! Wonderful bargello background – so pretty! Awesome cards! I would love to know how to do this! Wow this is amazing ribbon weaving! I would love to try this! Wow! Awesome cards. I can see that took a lot of work on the design. Fabulous. Fabulous cards. Love the mosaic. WOW!!! Both of your cards are Amazing Bonnie!!! I love how you used all of the ribbons and made it look like a quilt pattern–this is SO Cool!!! Fabulous Job!! !